Our Memphis event was quieter this year due to the weather and a popular event. Some early clouds, and then nice sun in the low 80s. Whole Foods Market was gracious to host our event. They provided us with the entire front row for parking our electric vehicles, and the use of their Level 2 charger. 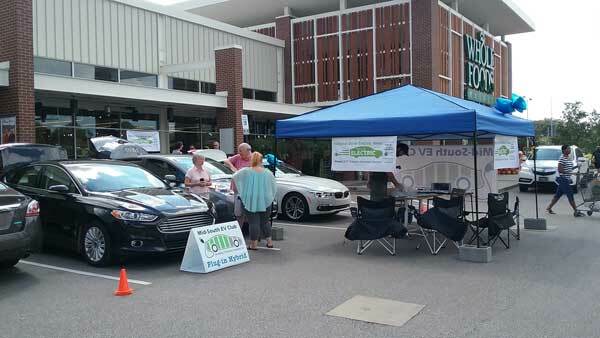 EV attendance was good, most mass produced EV and plug in were represented at our event. They included 1 Mitsubishi Miev, 2 Chevy Volts, 1 Ford Fusion plug in, 2 Nissan Leafs, 1 BMW i3 and 330e, and 1 Tesla Model S. 2 dealerships attended, Sierra Chevrolet & Roadshow BMW. Chevy brought the Chevy Volt, and BMW provided the plugin 330e for people to check out. The Whole Foods Customers, and their employees, were drawn to the cars. Clint brought his big tent, which helped keep the sun at bay. Come on over to see a wide variety of great looking and fast efficient electric cars. Speak with owners and see first hand the many benefits of owning an electric car. Registered attendees report 92,700 electric miles driven.